Car companies are like people, there are times we simply aren’t as laser focused as we should be and after a while, those that know you, will notice. Take the M5 for example, during the first two generations, this mid-sized sedan, wrote the book on what an uber-sedan should be. Agile, sharp, direct, incredibly capable, yet mature and elegant. Regrettably, the last couple of iterations, not so much, as BMW seems to have been enamored with the idea of bigger is better. 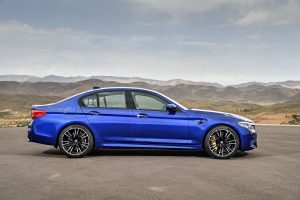 The BMW faithful moaned and complained and guess what, Munich listened and they delivered. Enter the 2018 M5 and finally, the focus and the execution is laser-like once again. Welcome back BMW, we’ve missed you. Approaching this latest version M5 from any angle is a designers delight. It looks modern yet with a perfect dash of aggressiveness. No, there are no boy-racer wings or huge fender flares. Instead, there are purposefully designed lines and hints of performance all over the car. 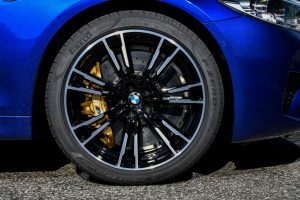 Simply looking at the front air intakes, the beautiful wheels and the large brake calipers and discs, you can immediately tell the M5 is all business, but never in your face about it. Ah yes, less really is more! The test M5 we had for one week, featured a gorgeous two-tone cinnamon-like interior which BMW calls Aragon Brown. This combination popped with the striking blue exterior paint. 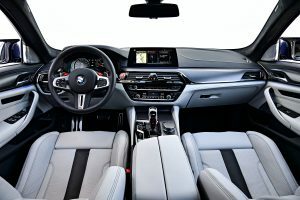 Fit and finish is the best we’ve seen from BMW in a long time, and that’s saying a lot, as BMW usually has superb attention to detail in its interiors. The latest I-Drive is the best yet, both in intuitiveness as well as information presented and its fast delivery speed. Switchgear controls are easy to understand and use, which in a car laden with technology, it can be a challenge. Rear seat is comfortable and easy to enter and exit, thanks to the more conservative sedan roof line. Trunk is well appointed and quite roomy. Golf clubs, a Costco run or a box of vintage champagne? Not a problem with the M5. Try that in a Porsche 911. So, how is it to drive? Simple answer: Breathtaking. How so? Glad you asked. The BMW DNA seems to have a delightful cohesiveness in the way all the controls work together. The throttle pedal as well as the brakes are silky smooth, every time. This is an easy car to drive luxuriously in traffic thanks to the dynamics of the controls. Crawling out of a tight parking space is a snap, especially with the available multi camera angles. 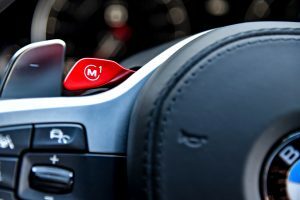 Select D and press the M button on the steering wheel, yes, it will take some menu configuration to get it to its maximum performance potential and the cool thing is that you can program what you like onto this “fun button”. Bravo BMW! Performance is simply stellar! How’s 3.1 seconds zero-to-sixty! This is super-car performance, in a sedan. All too quickly, you realize that you are traveling slightly more than what the speed limit is and thus, it’s prudent to back off. But oh, it’s so satisfying! 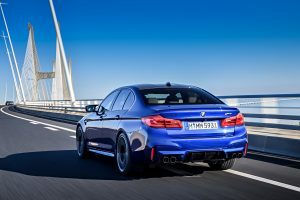 The new M5 now comes with BMW’s sophisticated version of AWD, called xDrive and the driver can select from different settings, shifting power delivery to the wheels fore and aft, depending on what you are looking for. There are several different dynamic driving selections within the I-Drive that one can select to fit your mood. 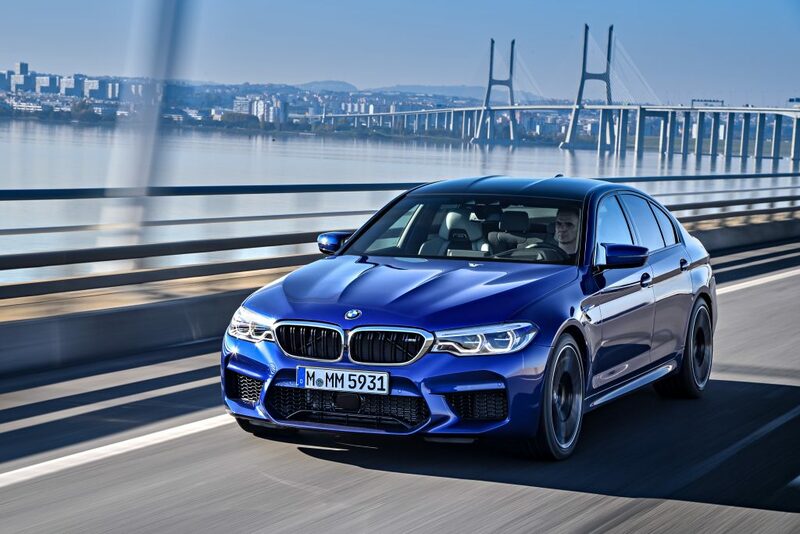 Life is all about choices and the M5 gives you plenty of them for whatever the driving style you would like to experience. Steering is more communicative than the previous model and feedback and effort is perfectly balanced. The optional M-Carbon Ceramic Brakes are incredibly good, with never any fuzz or drama. We tried several high-performance stops and there was zero brake fade. I mean ZERO! With each car that I test, I ask myself the same question. Would I own it and drive it as a daily? In the case of the M5, it’s an absolute YES! Competitors include: Mercedes-Benz E63s, Porsche Panamera Turbo, Audi RS7, Cadillac CTS-V.
Buying a high-performance car is all about emotion, the world class engineering and power delivery that will stir your soul with each drive you embark on. 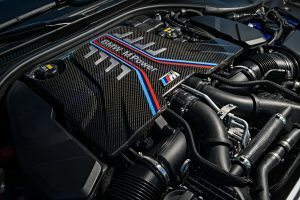 The all new M5 will easily do that and a lot more.